VirtaMed is the world leader in high-fidelity virtual reality simulation for training of minimally invasive diagnostic and therapeutic interventions in orthopedics, urology, and OB/GYN. VirtaMed has also created customized simulators for medical associations to provide specialized education for their members and target audience. Likewise, many industry clients have developed simulators with us to showcase their devices in a safe and clean environment and to train a larger number of physicians at a lower cost. With a combination of virtual reality, tactile feedback, realistic anatomic models, and original medical instruments, VirtaMed’s simulators provide the most realistic and cost-effective training environment for medical practitioners. VirtaMed ArthroS™ features knee, shoulder, hip, and ankle arthroscopy as well as the FAST module for basic skills training. VirtaMed GynoS™ offers practical teaching in hysteroscopic procedures, IUD placement, and embryo transfer, while VirtaMed UroS™ includes patient cases for TURP, TURB, laser BPH, and morcellation. Our mission is to change the way medical skills are taught and to improve the quality of care with cost-effective, state-of-the-art, virtual reality-based medical training and education. Just as pilots use flight simulators for training, we help medical practitioners gain experience before treating live patients. 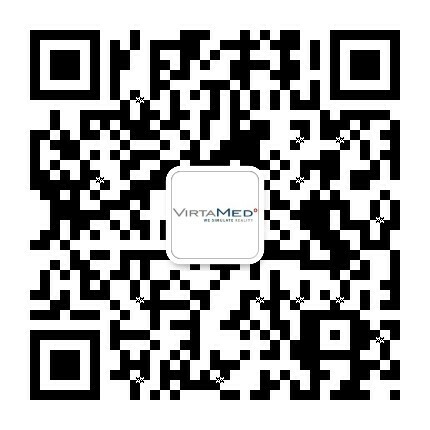 Virtamed medicine consulting (Shanghai) Co. Ltd.
No. 688 W. Nanjing Rd. VirtaMed is a registered trademark and uses (TM) in reference to our product lines, including: ArthroS™, GynoS™, and UroS™. These logos are intended solely for the use of the news media and other authorized users. Any use of the logo without VirtaMed's permission is strictly prohibited. The following logos should always be the first choice in all communication materials and should not be manipulated in any way. These images are intended solely for the use of the news media and other authorized users. Any use of the product images without VirtaMed's permission is strictly prohibited. The following product images should always be the first choice in all communication materials and should not be manipulated in any way.